Elections that decide who leads the executive branch of our federal government can have major impacts on agriculture, particularly from a regulatory, trade and tax perspective. It’s still the early days of the new Trump administration, but industry insiders have thoughts about how the political turnover might impact the professional lives of ag resellers and growers. Consultant John Gilliland adds there’s a possibility of lower personal tax rates for farmers, but points out the tax cuts come with a price that is still being scrutinized by U.S. agribusiness experts. “One of the most significant elements of the reform package is a new border-adjustment measure, which would tax goods based on the country where they are sold rather than where they are produced,” he says. Under this destination-based approach, imports into the U.S. would be taxed, while U.S. exports to foreign markets would be exempt. Industry analysts expect the border adjustment could provide a short-term boost to U.S. exports, but it would also mean higher taxes, at least in the short-term, for companies that must import necessary inputs from abroad. Many opponents worry it would translate into higher prices for U.S. consumers. Trade is an area where the president is apparently not in step with Congress, but that may soon change, says Knight. "As we review all of the executive actions and laws moving through Congress, the priorities for Syngenta will remain grounded in the importance of a science-based, risk-based, transparent review process at all agencies here and abroad." 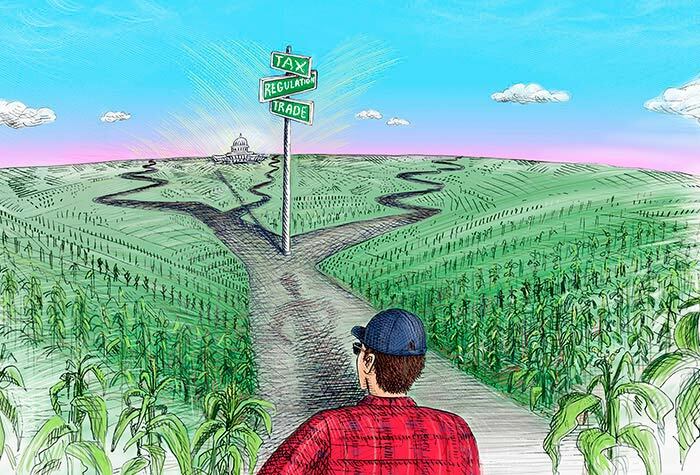 How changes in Washington could impact professional lives of #ag resellers and growers. The president has signed an executive order on reducing regulation and controlling regulatory costs, Peterson says. This includes repealing at least two existing regulations when promulgating a new regulation. Note: This article reflects the status of policies at the time of this writing in March 2017. Opinions expressed herein are those of the speaker and do not necessarily reflect the view of Syngenta. A breakthrough fungicide is helping growers of one of America’s favorite foods combat tough diseases, even in changing conditions.